As the weather brings gusty cold fronts and the fireplaces flicker on one by one, I couldn’t help but think that it was high time to get a little silly, a little sassy, and throw a kitschy tiki party. Rather than listen to the endless strains of “Baby It’s Cold Outside,” I wanted to belt some Mele Kalikimaka reminding me that just because Christmas is right around the corner, it didn’t mean that I couldn’t pretend that there were palm trees swaying outside. Well, actually, there are since I live in Arizona, but I digress. The lionshare of this menu came from recipes adapted from “We the Women of Hawaii Cookbook,” a hand-me-down from my grandmother that intrigued me the first time that I read it. The book is a collection of recipes from a club of the same name formed in 1947 during a utility strike. This group of women banded together to share their talents and traditions, and this book was formed as one of the products of the collaboration. I was able to tweak many of the original recipes (Excessive sugar? MSG? No thank you! And what the hell is “brown” in the recipe that calls for “1/4 c. brown”? Aye yay yay…) The resulting recipes were divine, managing to transport us to the islands with not too much work in the kitchen. Next time you feel a need to kick back tiki-style, give this menu a try. It’s not going to replace the sand beneath your toes, but it’s as soothing as a gentle surf and the mai tai will ease any lingering doubts. Fact. PS. If you like to play games, we finished the party with Tropically-Themed Scattergories. Three minutes on the clock…what’s a reason that your vacation was bad starting with the letter “H”? GO! This traditional Hawaiian salad is made from raw tuna and a sweet and savory sauce. It typically highlights other island fav ingredients, such as seaweed, macadamia nuts or avocado. This particular version leverages Indonesian sweet soy, sesame seeds and scallions for the toothsome dressing. If you love crab rangoon, but hate how many places use artificial crab meat, or worse, only cream cheese, then this is the recipe for you. Tender crab is perked up by sesame oil, ground ginger and the crunch of water chestnuts, with just enough cream cheese to bind it all together. The kona coffee in this recipe serves to glaze these wings into mahogany glory – simply make the marinade, bake in the sauce and broil to finish, for some truly lip-smacking nibbles. These ribs are for the hungry and lazy – a troublesome combination that is often hard to please. Parboil the ribs in a pressure cooker to cut down on the cooking time from hours to a mere 15 minutes. Paint with homemade glaze and broil for fresh off the grill goodness right from the kitchen. Done and done. So I was not about to dig a pit in my backyard to roast a pig (unfortunate given that I really, really, really wanted to), meaning that I had to come up with an ingenious solution for the Hawaiian slow cooked pork wrapped in banana leaves that is a luau favorite. Cue the Reynolds oven bag – this little baby managed to keep the pork moist and happy, ready to pull in only 2 1/2 hours time. Success! You’ve got your pulled pork, so why not your slaw? This version uses soy, sesame and peanut butter to enliven the traditional mayo base. It’s crunchy goodness worthy of any barbecue, asian or no. 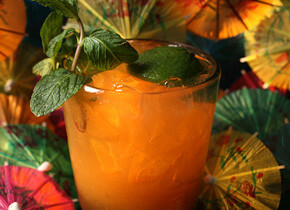 Throw out all of the hooplah recipes using pineapple juice to make your mai tai. This classic recipe, courtesy of Chow.com is the real deal, using an almond syrup called orgeat to keep it on the up and up. Because orgeat can be hard to find, I make mine from scratch using this fabulous (and simple) recipe from Imbibe Magazine. These little babies are sweet, sticky goodness with the most minimal amount of effort. You may want to bake two batches, because they go super fast. I LOVE the Tiki Room and was just there a few weeks ago! This is a fabulous concept. I love it! Everything looks delicious too. Angela! I love your "take" on the Hawaii food scene! So wish we could have joined you! It all looks fabulous!! I make no claims that this is authentic Hawaiian other than the fact that some old Hawaiian women in the 1940s wrote recipes for their Junior League-eqsue cookbook that I then adapted for this "I Wish I Was in Adventureland in Disneyland" menu. But it still makes me happy. And as much as we missed you guys, I need come visit YOU and eat some authentic Hawaiian. Fact. Maybe next time we'll actually cook something together? This is an awesome idea! I can't wait to try some of your recipes…. What a fun meal – fantastic menu! Reminds me of great memories of Disneyland with my grandparents and the Tiki Room – I swear that was their favorite part of the day! *singing* Where the birds sing words and the flowers croon! Love that place – I should ask my husband if he'd have a problem with us decorating our living room that way, LOL.